Abstract: The Asus WL-330 is a tiny wireless access point so nondescript as to be practically invisible; in fact it is about the size of a lighter. Every once in a while here at PCstats, amongst the typical flow of high-end motherboards and video cards that pass across our test bench comes something that makes us sit up and say "hey! That's kinda cool...!" Whatever the gadget, it's always refreshing when a company goes a little out of their way to design something with features and functionality that you can't normally get. ASUS has a reputation for innovation and reliability in their motherboard and video products, and as we'll see today, they are no design slouches in the networking department either. In this article, we'll be looking at the ASUS WL-330 Pocket Access point. This nifty little gadget's main purpose is as a massively portable 802.11b wireless access point; hook it into any wired Internet source and you have an instant hotspot. This diminutive device also doubles as a USB-powered 802.11b wireless adaptor. We haven't looked at many of Asus' network offerings recently, so we were interested to see how the Asus WL-330 Pocket 802.11b wireless access point would stack up to comparative Wi-Fi solutions. Not that there's a lot of competition in the area of ultra-portable wireless access points, but we digress. Users Manual, Driver CD, CAT 5 Ethernet Cable, AC power adaptor, travel carry case. The Asus WL-330 is a tiny wireless access point so nondescript as to be practically invisible; it's also about the size of a deck of cards. The unit supports 11Mbps 802.11b wireless, and is designed to act as a wireless access point, or wireless adaptor in a pinch. For example, we originally picked up this neat little gadget at CES 2004, and since then it has been used at a couple of different technology trade shows including Computex in Taiwan. 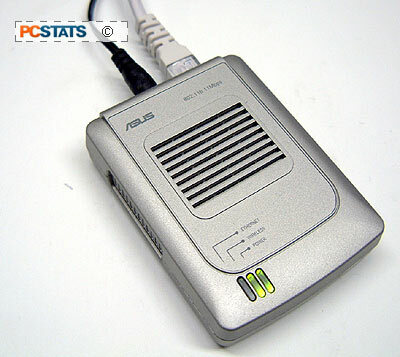 The beauty of the Asus WL-330 is that it can bring wireless network access to the base of PCstats mobile operations - ye old hotel room. The WL-330 could just as easily be applied to an existing Ethernet network in a conference room, allowing room-wide wireless networking for several users, as all the necessary components (power, network cable, and itself) fit into a small paperback-sized black nylon travel case. The unit is a true travelers friend too. After a long day walking through exhibition buildings at a trade show like CES, it's quite convenient to use a wireless equipped notebook in the hotel room to check email, and get the work done. Since hotels offer their in-room internet services differently, all you need is a nearby power socket, and an RJ-45 ethernet jack to plug the Asus WL-330 into, and you're good to go... 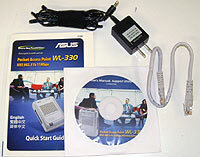 So handy is the Asus WL-330, that it has become an essential bit of kit when travelling.